Split path testing refers to where an A/Bn test changes multiple sequential pages rather than just a single page. This tends to be used for multi-step registration forms, checkout forms and wizards. The benefit of split path testing over A/Bn testing is that it produces a consistent experience throughout the whole path and allows you to change the order of input fields and steps in the journey. 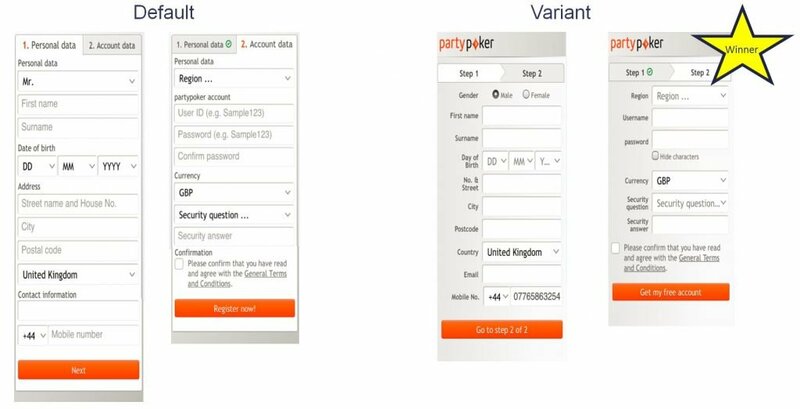 Split path testing provides the opportunity to discover new ways of optimising the conversion journey that you would never discover if you only ever conducted standard A/Bn or MVT experiments. Added the logo to each page as this is a web convention. Improved contrast by changing the background. Changed the page heading to confirm the number of steps. Removed the labels from each input field and placing them to the left of each field to improve usability. Show password as the default. Changed the wording on the CTAs to align with the outcome they result in. The new user path resulted in a 6% uplift in visitors completing the mobile registration form and led to a significant improvement in revenues for the app. The next test planned was to use a concertina design where only the first 3 fields of each step would initially be displayed. This again would necessitate a split path test to ensure consistency of the user experience. For an important user journey such as the registration path split path testing is invaluable for optimising the journey.